Fifty years ago today, Pope John XXIII issued Pacem in Terris, an encyclical that explicitly offered Catholics and others an historic warrant for civil disobedience and civil resistance. Fifty years ago today Pope John XXIII did something unusual, at least as far as popes are concerned: he gently placed a love letter in humanity’s trembling hands. Papal letters, before and since, have typically been meant only for Catholics, but Pacem in Terris — Peace on Earth — was addressed to any and all who cared to read it. Written as John was dying of stomach cancer, the encyclical was an urgent call for peace, human rights and justice interweaving the vision of a more humane order free from war with practical steps to move the world concretely in that direction. In light of the unrelenting epidemic of war and injustice since 1963, John’s S.O.S. could reasonably be judged a failure. But such a conclusion would overlook the campaigns, movements and attitude shifts it has inspired since it appeared. Pacem in Terris — whose subtitle is “An Encyclical on Establishing Universal Peace in Truth, Justice, Charity and Liberty” — unleashed currents of peacebuilding that are still at work. Most important, it laid significant foundations for nonviolent action needed now more than ever. John’s letter was not an abstract theological treatise. Rather, it was in part a direct response to the growing danger of an accelerating nuclear arms race between the United States and the Soviet Union at the time, symbolized most starkly by the Cuban Missile Crisis that had taken place a few months before. John XXIII’s 11th hour intervention was a plea — but a plea that was also a powerful nonviolent action. He did not remain silent. Nor did he simply rail against the parties — anathematizing one side or the other, or both, as past popes were wont to do. Instead, he actively put the weight of the church behind an invitation for both sides to give up their individual truth for a larger one and to break the inexorable cycle of unimaginable violence. Before becoming pope, Angelo Roncalli had played many peacemaking roles as a priest, papal ambassador, and bishop both before and during World War II, but his most powerful peacemaking played out during this most dangerous moment of the Cold War. 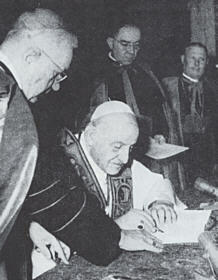 For the remaining months of his life, John XXIII continued to foster peace between the two global antagonists. “World peace is mankind’s greatest need,” he told Cousins. “I am old but I will do what I can in the time I have.” Part of this included writing Pacem in Terris, which he began in November 1962. Just as his response to the Cuban Missile Crisis was ultimately more an act of peacemaking than a simple plea for peace, Pacem in Terris can fruitfully be thought of as a form of nonviolent action even more than a call for it. Rooted in the experience of peacemaking, its direct speech challenged militarism concretely and set out steps for change: the number of weapons in every country must be reduced; atomic weapons must be banned; and disarmament must be established and enforced by common agreement. It also explicitly offered Catholics and others an historic warrant for civil disobedience and civil resistance: government authority need not be obeyed when it undermines “truth built on justice.” This pronouncement was a call to nonviolent resistance — which, over the past five decades, has inspired and legitimated action, from the church hierarchy in the Philippines organizing nonviolent action against the Marcos dictatorship to Archbishop Oscar Romero’s courageous solidarity with the poor, to innumerable movements for peace and justice around the globe — but was also itself an act of nonviolence, sending shock waves through systems that had for centuries come to expect the church to rubber stamp militarism and injustice. These thoroughgoing implications of Pacem in Terris, though, have often been missed by the church — both the hierarchy and the membership — over the past half-century. The encyclical has been dismissed by many as a lovely but impractical call for peace, thus often keeping us from taking the full measure of what it represents: a powerful challenge to how the world is organized and armed — and a further challenge to people of faith and conscience to actively resist these arrangements. The contradictions between beautiful words and the failure to translate them into gumption and risky action can tempt us to dismiss both the words and the structures for whom they are intended. But this can let us off the hook. 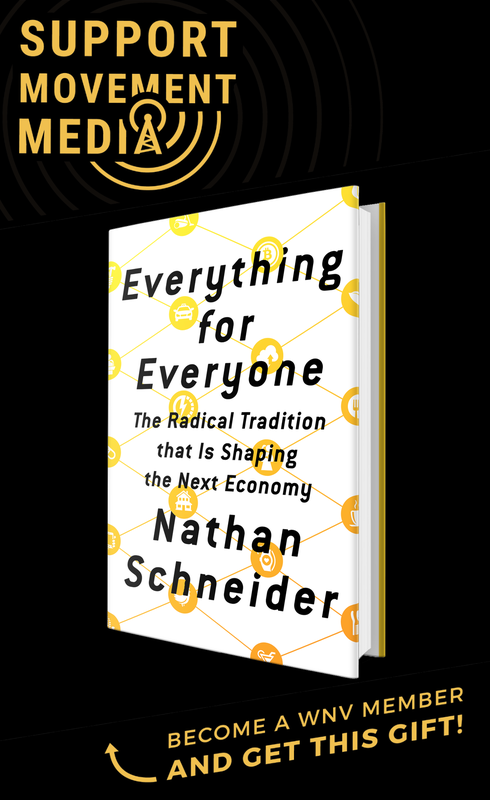 Luckily there are cases of the power of nonviolent action that any one of us can experience, learn from, and replicate — and by doing so, offer an example of the power just waiting to be tapped. One example comes from the emergence of Pacem in Terris itself. Without knowing that John XXIII had begun to write this encyclical, a long-time Gandhian, Catholic activist, Lanza del Vasto, decided to quietly call on the pope to issue such a statement. Del Vasto had lived and worked with Mohandas Gandhi in India, who had given him a new name: Shantidas, or “Servant of Peace.” Eventually he return to southern France to found a “Gandhian Order in the West” entitled the Community of the Ark. The community mounted numerous nonviolent action campaigns, including resisting the French war in Algeria, nuclear weapons, torture, conscription and the extension of a military base in southern France. As he recounts in Warriors of Peace: Writings on the Techniques of Nonviolence, del Vasto traveled to Rome in March 1963 to undertake an unpublicized “hidden fast” for 40 days to encourage John XXIII to issue a message of peace. He wrote to the pope explaining what he was doing. Del Vasto offered his own silent fasting body like a tiny candle in the darkness of those times — not as a reproach or a demand, but as a point of light of intention, constancy and support. For much of the fast it was not clear that the letter had reached the pope. Finally, on April 10, del Vasto’s wife Chantrelle met with a monsignor in the Vatican Secretariat of State. The monsignor assured her that the letter had, indeed, been read. Then he said, “Actually…the answer is here!” and he handed her the encyclical Pacem in Terris, which was to be published the next day. “There are things in it that have never been said, pages that might have been signed by your husband!” The day after the encyclical was released, a priest from the Vatican visited del Vasto and presented him with gifts from Pope John. Two days later, on Easter Sunday, he broke his fast. When del Vasto read Pacem in Terris, he found that at least two of the themes contained in the letter he originally sent to John XXIII were present: a strong condemnation of nuclear weapons and a call for resistance to unjust civil authority. One of the sentences from his letter even made it into the encyclical (“we must obey God rather than men”). Del Vasto’s fast is not responsible for Pacem in Terris — it was already in process when it began — but it is intriguing that this nonviolent action may have helped contribute to one of the letter’s keys themes: the warrant for spiritually-grounded civil resistance. Fifty years on, “peace on earth” remains far off. But we also have much to learn from those who have envisioned this possibility — and risked putting this vision into practice in large ways and small, like John XXIII and Lanza del Vasto. On the 50th anniversary of the message in a bottle that is Pacem in Terris, we honor its roots in nonviolent action, its impact as a form of nonviolent action, the nonviolent action it has inspired, and the nonviolent action yet to come. When all else fails our government is one of the last recourses to solve problems. Yet today our government seems too willing to fold up and into large corporations that are both politically and morally often atheists in nature. Thus the massive harms from Keytone pipes and Canada’s rubber stamping each TarSands project with the U.S. close behind. Creative nonviolence by Universities seems in this case the last resort that overlaps so many other corporate/government addictions to growth that is now cancerous to our planet and people more pervasive than nuclear bombs. Non-violent protests, sit-ins, occupy,… can we go further to achieve the meaningful changes that politicians have misled and refused us all this while ? Humanhood international is propagating global, non-party representation by conscientious members of society on issues in policy formulation, decision making and implementation as the next step forward towards achieving the moral objectives that we, singly and collectively, so thirst after.